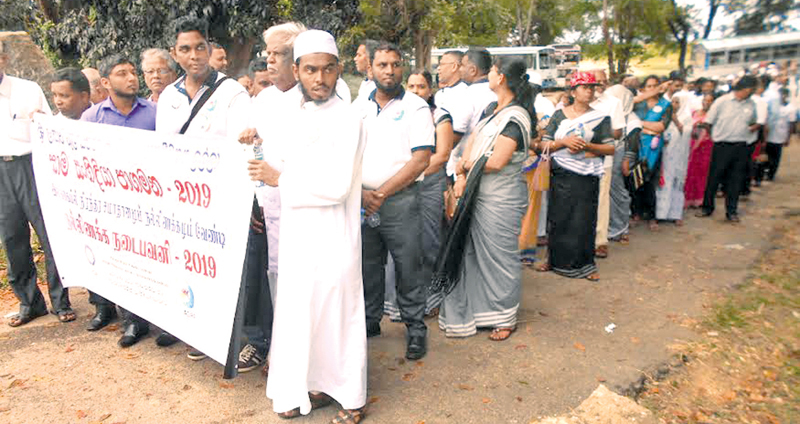 The Ampara District Reconciliation Forum (ADRF) together with Peace & Community Action (PCA) organized a ‘Walk for Peace and Reconciliation’ from the Ampara Town Clock Tower premises upto the Ampara District Secretariat recently. It was held under the patronage of the Peace & Community Action (CPA) National Co-ordinator T.Thayaparan and co-ordinated by The Ampara District Reconciliation Forum (ADRF) Co-ordinator Dr. S. L. Azees. Religious Leaders from Ampara, Uhana, Addalaichenai, Akkaraipattu, Alyadyvembu, Sammanthurai, Karaithivu, Kalmunai, Kalmunai – North and Navithanveli Divisions Reconciliation Forum Members from all three communities took part in this procession. A special meeting was held in this regard at the Ampara District Secretariat premises. Religious Leaders, government officials and many others attended this meeting. They handed over a peace declaration to Ampara District Secretariat Officials to be established in the country. Ampara and Damana Divisional Secretary H.S.N. De Zoysa Siriwardena, Ampara District Chief Accountant M. I. M. Musthaffa, high ranking officials and others were also present.